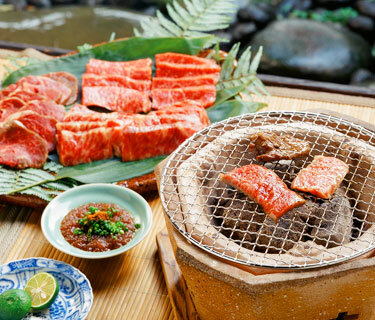 Yakiniku (barbecued beef) is a cuisine that originates in Korea. The straightforward method by which beef is simply barbecued is also popular as an outdoor pastime. Enjoy the rich and tasty flavor of Kagoshima Kuroushi with this refreshing sauce. 1) Slice beef into pieces approximately 0.2 in. (5-7mm) thick. Grate onion and sauté until the liquid is gone and turns brown. 3) Add mirin and soy sauce after the onion in (2) turns into paste. Mix thoroughly and remove from heat before adding citrus juice, chopped Japanese welsh onion and shichimi togarashi or ichimi togarashi. 4) Grill the beef to desired doneness and dip it into the sauce prepared in (3) before eating. It is also delicious with squeezed sudachi and salt. Kagoshima Wagyu is raised in a natural environment with abundant greenery and a mild southern climate. This cattle is raised to produce healthy beef, by way of assorted feed containing sweet potato and strained lees of shochu (Japanese distilled spirit). It is well known for its fine and tender texture, and mild and rich flavor produced by its delicate marbling. At this point use citrus juice such as sudachi, yuzu or lemon. Sudachi is a small fruit about 1 oz. each with fresh fragrance and acidic taste. The juice is rich in vitamin C and also squeezed like lemon for use with sashimi, grilled fish and deep-fried dishes. Yuzu is a citrus fruit with strong acidic flavor. Its peel has a fresh fragrance and used also to add a colorful touch to dishes.